He said that Twitter currently incentivised people "to post outrage". Instead he said it should invite people to unite around topics and communities. "It may be best if it becomes an interest-based network," he told TED curators Chris Anderson and Whitney Pennington Rodgers. Doing so would require a systematic change that represented a "huge shift" for Twitter. On the topic of abuse, he admitted that it was happening "at scale". "We've seen harassment, manipulation, misinformation which are dynamics we did not expect 13 years ago when we founded the company," he told TED curator Chris Anderson. "What worries me is how we address them in a systematic way." "One of the choices we made was to make the number of people that follow you big and bold. If I started Twitter now I would not emphasise follows and I would not create likes. "We have to look at how we display follows and likes," he added. 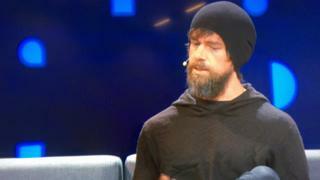 "It's a pretty terrible situation," Mr Dorsey admitted. "The dynamics of the system makes it super-easy to harass others." Asked if he would show urgency in dealing with the issues, he replied simply: "Yes." But in her question to Mr Dorsey, she turned her attention to abuse she has received on Twitter. "I'd like to know why a video that showed me being beaten up and threatened with a gun to soundtrack of Russian anthem stayed up for 72 hours despite 1000s of complaints?" she wrote. Instead he said that the company was in the middle of measuring the "conversational health" of the platform, using a number of metrics, including how toxic conversations were and how much people are exposed to a variety of opinions. "We have to create a healthy contribution to the network and a healthy conversation. On Twitter right now you don't necessarily walk away feeling you learned something."